Update 8/26/15: There has been a great deal of feedback to Google regarding the new contacts preview and contact groups. One of the more frequent complaints was with regards to which of a contact's email was included in a contact group. Classic contacts has the ability to select which email was included in a group, while the new contacts preview does not have the capability. Until recently, there were issues with the new contacts preview honoring the email address selected in classic contacts for a group. Recently, the Contacts team has pushed an update to the new contacts preview that not only honors the email selected for the group, but also now displays the email that is used for the group as shown in the image below. It should be noted that you still cannot select which email is in the group from new contacts preview. For this functionality you will need to return to classic contacts. 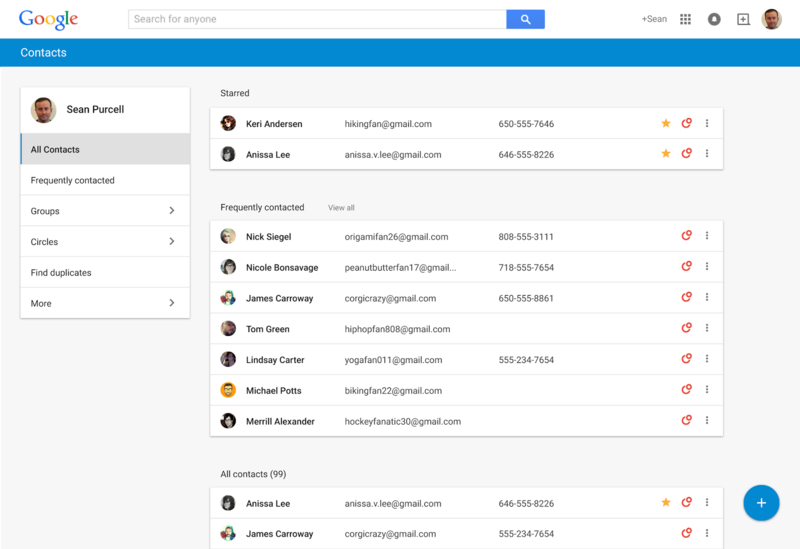 Last week, Google pushed out a preview of the new contacts page to all of its users. Upon arriving on the contacts page, users were automatically redirected to the new contacts page at contacts.google.com/preview. Here they were introduced to a redesigned page that implemented a complete Material Design makeover. Users have the option to return to the classic version of contacts by selecting "Leave the Contacts Preview" from under the More section of the left hand menu. So what is new with this redesigned contacts? 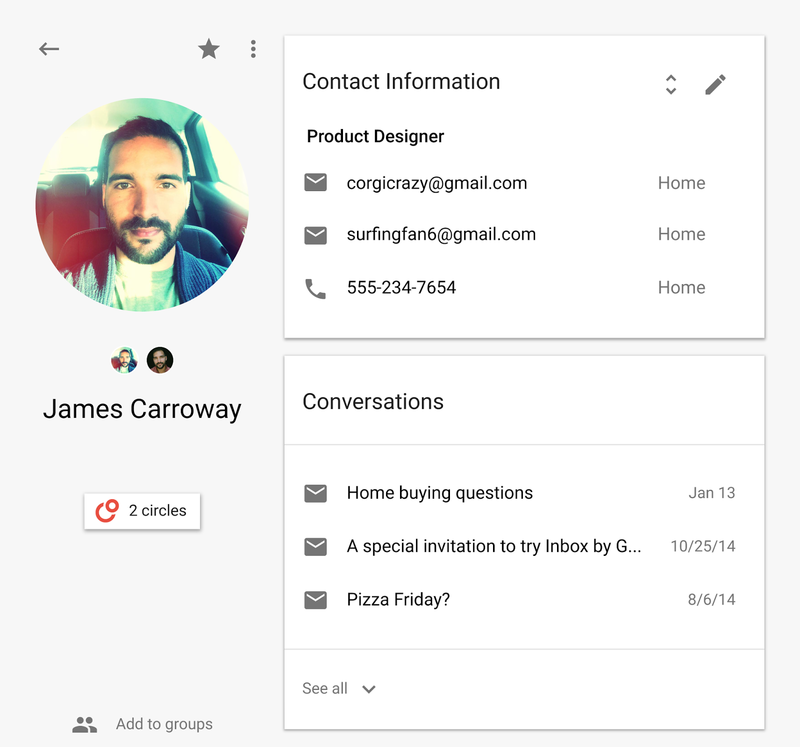 Essentially, this new contacts takes the beauty of material design and provides easier ways of managing your contacts. The first thing you will notice is that your Starred and Most Contacted people are listed right at the top of the page. To make things more convenient contacts and circles are now combined together in the All Contacts bundle. The new Contacts has simplified the process of finding and merging duplicates. The process has been completely redesigned. With a simple click on the menu choice "Find Duplicates" all of the duplicates will be displayed and options to Merge All, Merge individual or dismiss are presented. 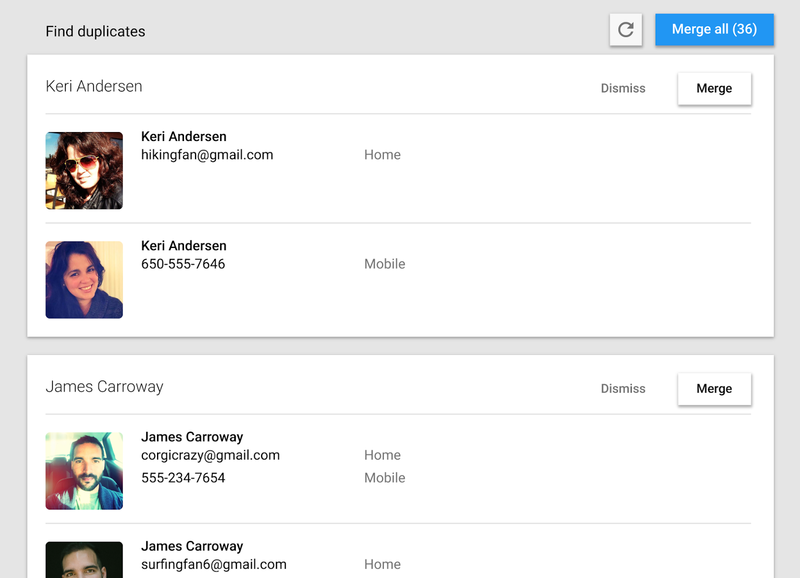 As your contacts change their information, the new Contacts page simplifies the update process by combining the contact's G+ profile information with the information you already have entered. So, as long as the user updates their G+ profile, you will also have that information in your contact page. For me, the best part of this new redesign is that contact cards now show recent conversations and meetings. So if you come across a contact that you are not sure why you have them, you can easily figure it out by viewing recent conversations/meetings. It is not known at this time if this will be an option in the future, or at some point everyone will be upgraded to this new Contacts page. What do you think of the redesign? I happen to really like the new look and feel; especially how much faster the interface seems compared to classic contacts.